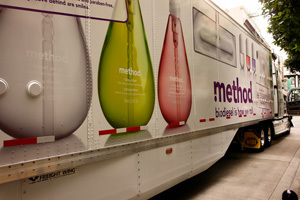 What's cool about our biodiesel rig? Seen it on the road already? Let us know. 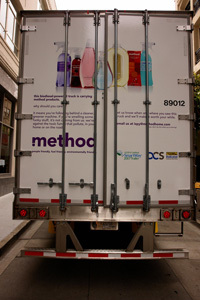 Or even send in your method truck snapshots – we’d love to see them too! Now that is a sustainable product I can feel great about...from manufacturing and transport to the shelf...to the recycle bin! You should join your state trucking association, other businesses have a lot to learn from you! 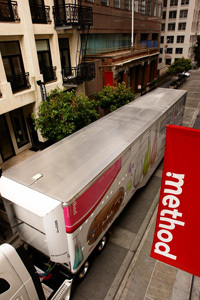 Do all of your products get delivered via this truck or more like it? Or do some get delivered by regular trucks? How do you figure out where to drive this? Biodiesel is not available most places I know about. Is this leased or owned equipment? From a business perspective - a fleet of any size is a massive capital expense for a growth-oriented company to bear. As an advocate of Method and sustainable business, I hope they employ an incentive-based approach with third party carriers (for alternative fuels or etc.) before accumulating capital assets like this. Although your truck is definately a step in the right direction, biofuels are not the answer. The costs associated with their production are too high for the consumer. Have you thought of solar panels and vegetable oil like a catering truck I've seen on the Green Channel? Makes more sense.....maybe even solar and wind combo.